Well, it's been making the rounds along all the blogs, I figured I may as well do this myself. Not all that much there, but it's enough to keep me interested. 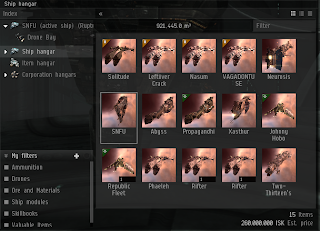 Solitude - Jaguar that I can't quite fit how I want, passive shield tanked, meant to wear down bigger ships, completely able to ignore incoming DPS from drones. I've taken it out a couple times when we needed heavy tackle, but no real stand out fights in it yet. Leftöver Crack - My go-to Wolf fit, stolen from Ava Starfire. This fit has definitely done me some good, with kills such as this. Nasum - Similarly fit, though it has a SAR2 rather then Centii C-Type. VAGADONTUSE - Fit, but unused Vagawolf. I fit it, only to figure out my skills related to keeping the modules running are horrible, and it's sat since then. Neurosis - Cyclone I won on Blink. Can't fly it yet, but, I've got a full XL SB fit sitting for it here. SNFU - 1600mm plate Rupture, just started flying these, and loving it. Abyss - Brawling shield fit Stabber. It's pretty crappy. It's cheap. It's fun to fly. Propaghandi - SFI I picked up cheap recently, don't intend to fly it until I can really fly it well. Xasthur - Shield fit Thrasher, all gank. Definitely fun to fly. Phaeleh - Standard 200mm/SAR Rifter. I may switch it up though, since they seem to not be all that great vs other t1 frigs these days. Nothing all that special. I've got another Cyc and Hurricane sitting in Jita to take down eventually, both won on Blink. Most of the names are all music-related, mostly metal/punk.